The Fire Denyer System uses hard-wired, photo-electric, low-power, 8-16V, 4-wire , interconnected smoke detectors. Also referred to as smoke alarms. These include loud piezo alarm sounders built in. The interconnect system allows the Fire Denyer controller to activate the alarm sounders in all connected smoke detectors. 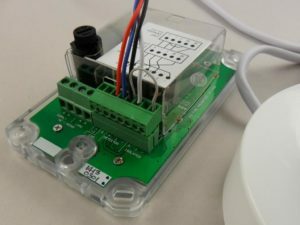 The standard detectors are improved by adding the Fire Denyer interconnect function, a plug connector board that includes the EOL termination resistor and easy to configure jumper. The dust protection from the rear is also improved to help resist dust being drawn through the detector from the ceiling above. 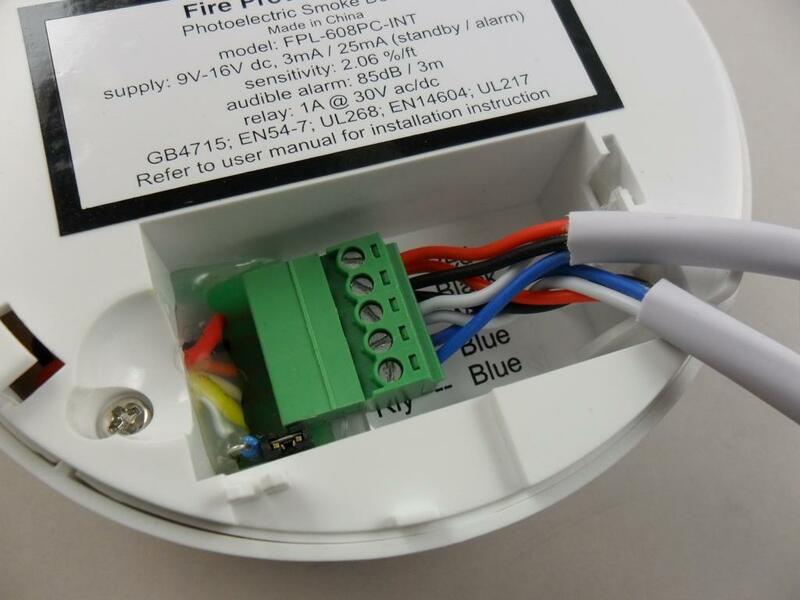 This is to reduce the chances of false alarms and reduce future maintenance requirements. 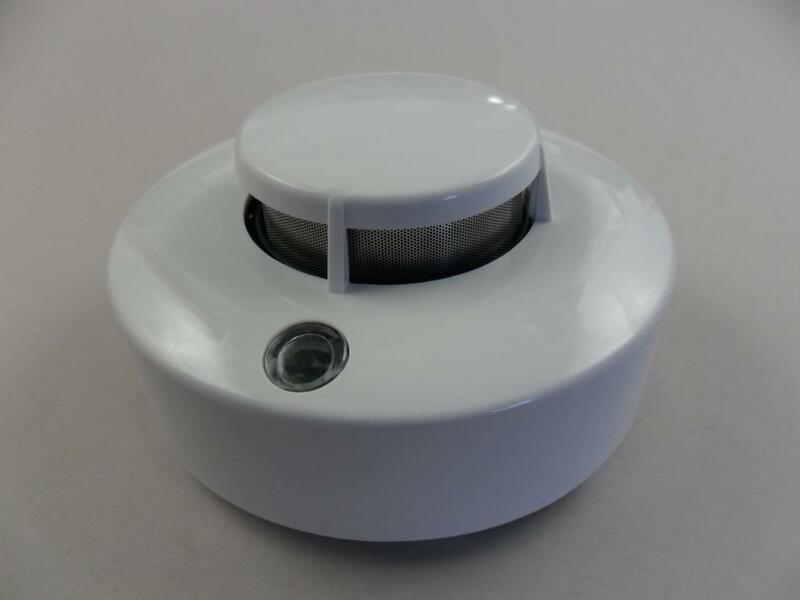 The smoke detectors must be mounted away from walls and corners and clear of pitched roof peaks. These areas can be slow to see smoke and delay detector activation. Mounting on large clear ceiling spaces is best. The standard detector wiring is 0.2mm 4-core security cable. Detector wiring carries low voltages and must not be run for any distance adjacent to mains wiring; ie. through the same cable runs. Standard security cable is not rated to carry mains power, but the outer sheath is rated to be safe to contact or cross other mains wiring. installation delays requiring fault finding can be avoided by ensure that the wiring is neat and tidy. Twist the wire strands to ensure that there are no stray strands to cause problems. 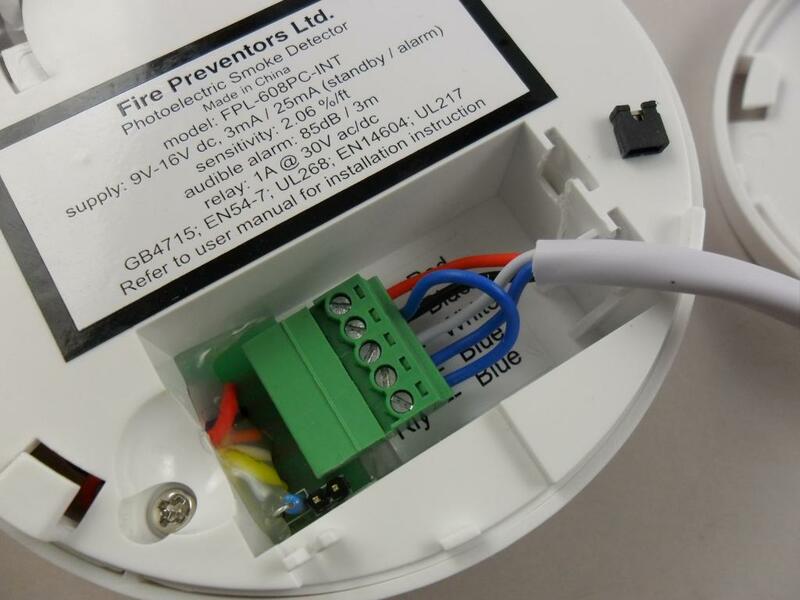 There can be up to 11 mid-line detectors wired to the Fire Denyer Controller. There is a wire in and another out, forming a series chain. The wiring is shown here. The end of line detector is the last detector on the circuit. The loop wire is connected as shown here, and the jumper removed to enable the EOL protection. The EOL protection provides tamper and fault detection for the complete circuit. The wiring connection is shown here. Note the loop wire from the end right terminal to the black wire terminal.